Estimated reading time: 7 minutes, 6 seconds. Pinterest has become immensely popular among businesses because it’s relatively easy to engage audiences and increase brand presence. The platform has an inspirational theme, a user-friendly interface, a multitude of tracking tools, and a comparatively wealthy user base. We’ve highlighted some of the most creative and innovative branding strategies in recent years from the following companies, perhaps that can inspire your own campaigns. The Campaign: Fashion is without a doubt one of the most popular topics on Pinterest—more than 24 million fashion ideas are saved on the platform each day. 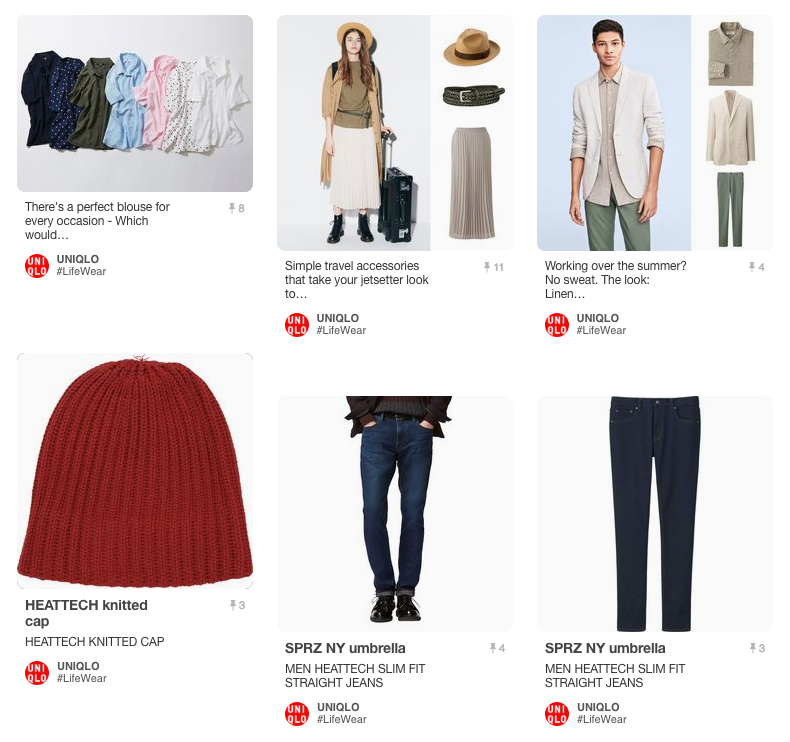 The Japanese fashion brand Uniqlo launched a Pinterest campaign to promote their fall/winter 2014 collection and to advertise its new LifeWear line. DIY hair tutorials are a popular area of interest on Pinterest, and Uniqlo posted 16 step-by-step DIY hairstyle tutorials on their website and their pinboard. The images show models styling their hair and wearing Uniqlo’s new line of clothes. They are standing in front of a mirror, thus displaying both the hairstyle and the clothes from each side. Even though Uniqlo does not specialize in hairstyles or hair products (they’re a fashion label), they managed to combine their products with the popular Pinterest subject of beauty tutorials in an interesting and unique way. True to form, the Uniqlo HairDo board has almost 15,000 followers—more than any of the company’s other boards. Savvy Tip: This strategy can be applied to your campaigns: even if you don’t specialize in one lifestyle trend, is there potential to add to the conversation from your unique angle? This method of following Pinterest trends and curating content to what users want can help engage existing customers, and also potentially attract new ones. The Campaign: In recent years, the cosmetics market has flourished online with consumers turning to digital platforms like Pinterest for peer reviews and beauty tutorials. 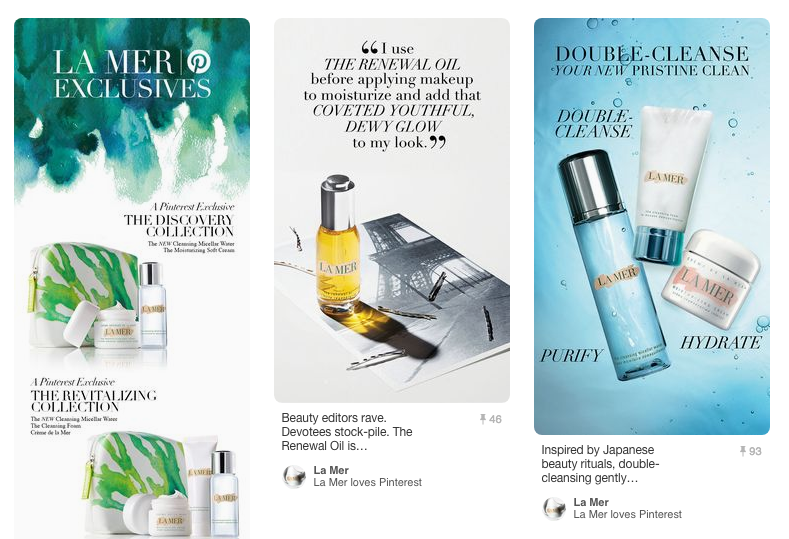 Estée Lauder’s Crème de La Mer is a line of skincare products that have become a cult favorite, highlighted on many personal pinboards, which demonstrates pinners’ “advocacy and aspiration towards the brand,” according to Kelly McDonnell, director, global social & digital marketing for La Mer. Building off that online popularity, the skincare label developed “Made for Pinterest,” three curated sets exclusively available through Pinterest. Each set highlights one skincare trend and is pinned to the board “La Mer Loves Pinterest,” where pinners can learn more about the products, view tutorials, and find links to La Mer’s website for purchasing. Interestingly, the sets are based on what skincare topics were searched and pinned the most on Pinterest. The campaign is meant to introduce the brand to younger, beauty-savvy consumers who explore beauty trends through a social media platform driven by inspiration and aspiration. Pinterest has proven to be the ideal social media marketing channel for La Mer, as it represents the brand’s target demographic and offers opportunities for streamlining customers’ purchasing journey. Savvy Tip: Estée Lauder noticed what products were popular, and listened to their users’ needs and interests. This allowed them to tailor products specifically to their Pinterest user base, which shows genuine engagement and appreciation for the company’s customers—a quality you can take into your own campaigns. The Campaign: The credit card company launched a branding campaign about acceptance during the New York City Pride Weekend. On one hand, the campaign was about MasterCard being accepted around the world. On the other, it was also about spreading awareness about the acceptance of people. 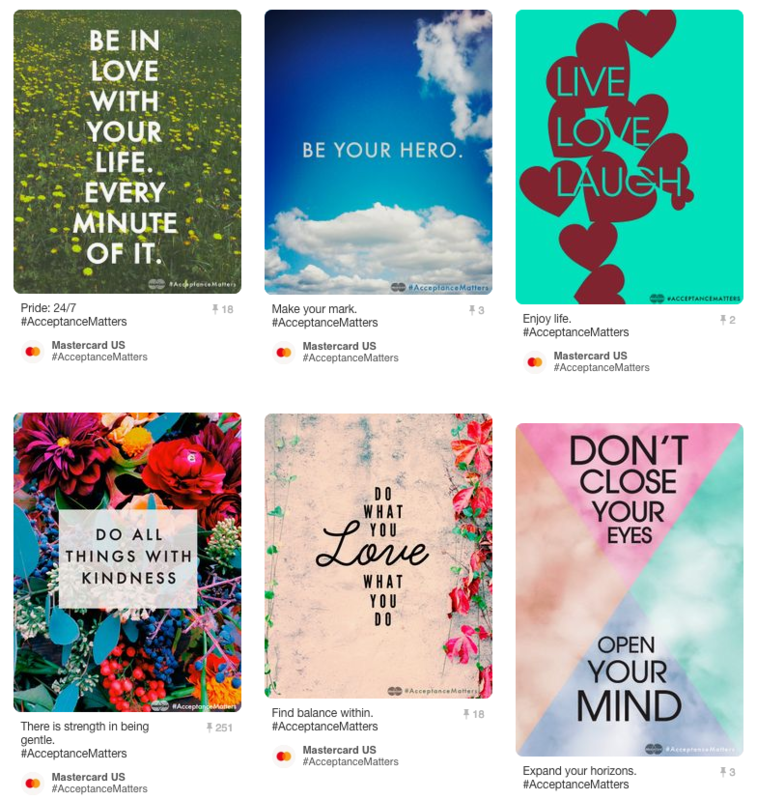 Since Pinterest is primarily a forum for positive messages, MasterCard introduced the hashtag #AcceptanceMatters and collaborated with a number of Pinfluencers. Pins about #AcceptanceMatters would link back to a Facebook contest that asked users to submit photos demonstrating what acceptance meant. While MasterCard’s pinboard had no followers at the beginning, it gained 171 followers during the time of the campaign. 1 Moreover, 24.5 million media impressions and 13,000 repins were won in 9 weeks. Inspiring followers to make the world a better place and working with well-known Pinfluencers allowed Mastercard to reach out to a vast audience within a matter of weeks. Savvy Tip: As Steve Jobs once said, “People don’t buy what you do, they buy why you do it.” In today’s interconnected world, more and more consumers are concerned with whether a brand stands for what they believe in. A growing number of consumers are hyper-aware of social issues and want to support companies that share their values. Building positive campaigns around social issues you truly support can foster brand loyalty in the audiences you want to serve. The Campaign: The French car company introduced a particularly original Pinterest campaign for their newest models the Boxer, the 107, and the 3008. Pinners were challenged to complete a “Pinterest puzzle.” Peugeot’s Pinterest page featured several images of cars running over two or more boards. Each board was missing images and followers had to find them on Peugeot’s Facebook page or website. Once all images were found, pinned, and pieced together, they revealed one of the new car models. The first five people to piece the puzzle together were awarded prizes. The contest was a clever social media marketing idea in that it increased traffic to Peugeot’s website, Facebook, and Pinterest pages. 2 Who doesn’t love a good challenge? Anyone who has ever found themselves engrossed in a game or puzzle, be it tabletop or virtual, knows the eager feeling of wanting to play to the end. This sort of fun activity falls outside the lines of normal Pinterest campaigns and Peugeot was successful in stirring up user curiosity while highlighting their new products. Savvy Tip: What are some creative ways you could engage your users outside the normal realms of conversation? Think about what might delight your target audience – appeal to that childlike part of every person’s psyche, the one that wants to keep putting the pieces together until they reach that feeling of accomplishment. If you can be clever in piquing your customers’ sense of intrigue while promoting your brand’s mission, by all means, put the puzzle into play. The Campaign: From the owners’ childhood friendship to the company’s modest beginnings in Vermont to the humorous names of its ice cream flavors, frozen desert behemoth Ben and Jerry’s is well-known and well-loved for its zany yet endearing image. In that vein, they use Pinterest not to market their products but to introduce their company and give customers a more intimate glimpse into the company’s likeable inner chambers. 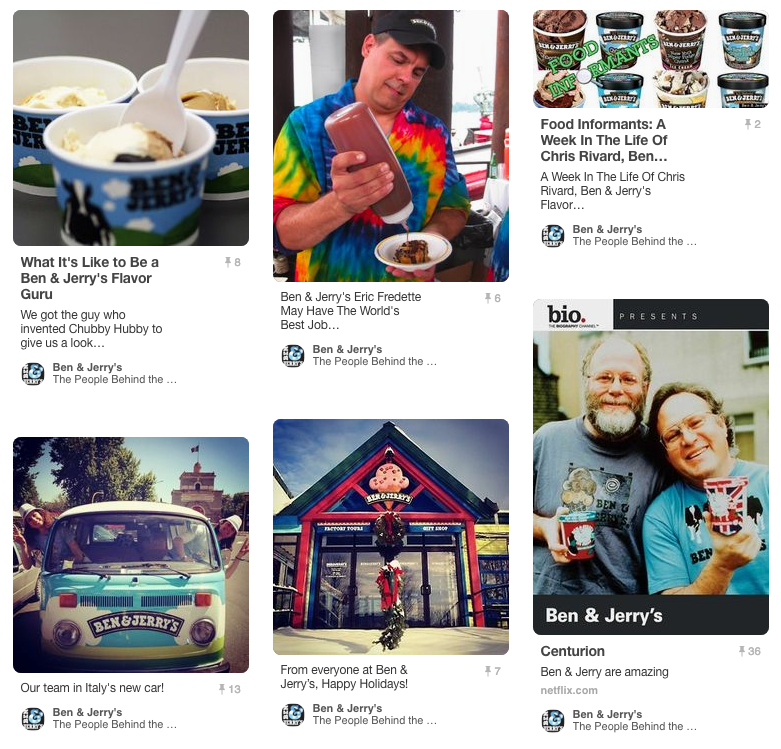 Ben and Jerry’s Pinterest page includes boards about the company’s employees, its factory, and its customers. Other boards are “On a Mission,” “History,” “Vermont,” and “Flavor Graveyard,” further establishing the brand through highlighting the company’s unique attributes. Moreover, the boards help foster the customers’ relationship with the brand by making the company accessible and involving its audience. Savvy Tip: Your brand story is an important part of your overall ability to connect with your audience. Consumers want more and more to feel close to the brands they like, and social media outlets allow companies to establish meaningful relationships with their user base. Be real, be authentic, highlight what makes you unique, tell your story with your own flavor of personality—and allow your customers to fall in love with who you are as a company. As you can see from the five campaigns above, each one is unique and specific to the company, the topic, and the audience. From crafting relevant tutorials to telling a remarkable brand story, there are so many ways to make the most of Pinterest’s visual, inspirational platform. Not long after its inception, Pinterest was already attracting brands that saw great potential to connect with existing customers while reaching out to new ones—in vital and creative ways. Pinterest has since caught up to its tremendous marketing potential and quickly introduced multiple tools to facilitate businesses’ customer engagement efforts. The network allows for creative marketing strategies that get people talking and sharing—a vital element in the world of social media marketing. What dynamic campaigns can you dream up?